Was campaign manager for Hillary Clinton’s 2000 U.S. Senate bid. Bill de Blasio was born Warren Wilhelm Jr. on May 8, 1961 in New York City and grew up in Cambridge, Massachusetts. Shortly after graduating with a bachelor’s degree from New York University in 1983, he legally changed his name to Warren de Blasio-Wilhelm, adding his mother’s maiden name to his identity. In 2002 he changed his name for a second time and became Bill de Blasio. Historian Ron Radosh describes de Blasio as: (a) “a far left radical whose ancestors are the New Left and the Communists”; and (b) “a bona fide red diaper baby” who, “like many of his generation … kept his parents’ … pro-Communist politics not far from his heart.” Both of de Blasio’s parents were far leftists—most likely, members of the Communist Party USA or some of its numerous front groups. His mother, Maria de Blasio, worked in the early 1940s at the Office of War Information—a U.S. government agency staffed largely by pro-Soviet leftists who depicted the USSR in a positive light. In 1983, while he was still at NYU, Bill de Blasio toured parts of the Communist Soviet Union. This was a period of significant Cold War tension between the United States and the USSR, as the Soviets were attempting to permanently solidify their nuclear superiority over the U.S. Notably, de Blasio at one time served as an organizer with the anti-nuclear, anti-American organization Physicians for Social Responsibility. De Blasio took his first job in 1984 with the NYC Department of Juvenile Justice. Three years later, having recently earned a master’s degree at Columbia University‘s School of International and Public Affairs, he was hired to work as a political organizer by the Quixote Center (QC), a Maryland-based, Catholic social-justice organization with Marxist leanings. In 1989 de Blasio served as a volunteer coordinator for the NYC mayoral campaign of Democrat David Dinkins. Following Dinkins’ victory, de Blasio became an aide in City Hall. 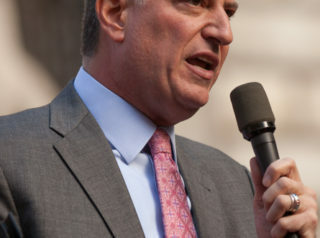 When asked in 1990 to describe his political views, de Blasio replied that he was an advocate of “democratic socialism.” In the mid-nineties, he served as executive director of the New York branch of the New Party, a pro-socialist, ACORN-affiliated entity to which Barack Obama likewise belonged. In 1994 de Blasio managed New York Congressman Charles Rangel‘s re-election campaign. When de Blasio married former lesbian activist Chirlane McCray that same year, the couple honeymooned in Fidel Castro‘s Cuba, in violation of the U.S. ban on travel to that country. In 1996 de Blasio ran the New York state operation for the Clinton–Gore re-election campaign. From 1997-99 de Blasio served as the New York/New Jersey regional director of the Clinton administration’s Department of Housing and Urban Development (HUD), where he served under HUD Secretary Andrew Cuomo. During that period, said HUD inspector general Susan Gaffney, de Blasio’s region lost approximately $23 million to scams perpetrated by public-housing officials, mortgage companies, and nonprofit groups that received grants from HUD. The New York Times, meanwhile, reported that in 1998-99, several people had defrauded HUD of $70 million in federally insured loans on more than 250 New York properties. De Blasio left HUD in 1999 to become campaign manager for Hillary Clinton‘s 2000 U.S. Senate bid. From 2001-09, de Blasio served on the New York City Council, representing District 39 in Brooklyn. In 2002 de Blasio joined a number of fellow legislators—mostly from the City Council’s Black, Hispanic, and Asian Caucus—in a City Hall ceremony honoring Robert Mugabe, the openly anti-white, Marxist dictator of Zimbabwe. In 2009 de Blasio was elected as New York City’s third Public Advocate. His candidacy was supported by the SEIU, UNITE HERE!, and the pro-socialist Working Families Party. In September 2009, when the community organization ACORN was engulfed in several major scandals involving voter-registration-fraud, embezzlement, money laundering, and racketeering, de Blasio wrote a letter to ACORN’s leaders reaffirming his support for the organization, though noting that he was “troubled” by the recent revelations. De Blasio was a vocal opponent of the January 2010 Supreme Court ruling in Citizens United v. Federal Elections Commission, which: (a) struck down a ban on corporations and labor unions using money from their general funds to produce and air campaign ads in races for congressional and presidential races, and (b) overturned a prohibition against corporations and unions airing campaign ads during the 30 days immediately preceding a primary or the 60 days preceding a general election. In the fall of 2011 de Blasio expressed solidarity with the anti-capitalist Occupy Wall Street movement. In January 2013 de Blasio announced his candidacy for Mayor of New York City. His campaign received endorsements from such notables as Alec Baldwin, Harry Belafonte, Bill Clinton, Hillary Clinton, Howard Dean, Jerrold Nadler, Barack Obama, Sarah Jessica Parker, Susan Sarandon, Charles Schumer, George Soros, Kathleen Turner, and many others. After de Blasio won the Democratic primary that September, it was announced that he would also be the nominee on the Working Families Party line in the general election. Patrick Gaspard, a former New Party staffer and Obama administration official with significant ties to ACORN, is a close friend of de Blasio and played a key role in shaping the latter’s mayoral campaign. In August 2013, de Blasio received the endorsement of the billionaire financier George Soros, who contributed the legal limit of $4,950 to the campaign. Soros’ relationship with de Blasio actually dated back to 2011, when Soros had given $400,000 to de Blasio’s Coalition for Accountability in Political Spending. As he pursued the office of NYC mayor, de Blasio was a self-described “progressive” whose political views represented a blend of European social democracy, Franklin Roosevelt’s New Deal, and liberation theology. (The latter was a Soviet KGB creation in the late 1960s, designed to infiltrate Christianity with Marxist principles.) “I’m … very deeply influenced by liberation theology, which I learned a lot about in the years I worked on Latin America,” said de Blasio. In October 2013, the New York Post reported that de Blasio, who owned two row houses in New York City worth over $1.1 million apiece: (a) had not registered his two-unit Brooklyn rental property with the city’s Department of Housing Preservation and Development as required by law, and (b) had failed to report his rental income in his annual financial-disclosure filings, as also was required by law. Said the Post, de Blasio “has not disclosed any rental income on filings dating back to 2007, according to records from the city’s Conflicts of Interest Board.” In response to the Post‘s revelations, de Blasio campaign spokesman Wiley Norvell said: “He declares the property as an asset on his filing, but the property has a negative income when you add up the depression of water and upkeep.” Crain’s reported that de Blasio’s 2011 tax return showed $47,500 in rental income and $62,200 in deductions for the property. In the immediate aftermath of de Blasio’s election victory, a George Soros-funded project known as Talking Transition sprang into action to promote the mayor-elect and to invite New Yorkers to communicate their ideas and concerns to him. He vowed to “stop efforts” by city case workers “to divert individuals from accessing cash assistance” rather than seeking employment. He planned to use Obamacare outreach workers to enroll more New Yorkers on a multitude of government welfare programs. He stated that New York’s total of 1.9 million food-stamp recipients—21% of the city’s population—was at least 250,000 too low. Bill and Hillary Clinton both attended de Blasio’s swearing-in ceremony as New York City mayor on January 1, 2014. Mr. Clinton, in fact, officially administered the oath-of-office to de Blasio, using a bible once owned by President Franklin D. Roosevelt. In one of his first moves as mayor, de Blasio appointed Zachary W. Carter as Corporation Counsel for the City of New York. Carter had previously represented Al Sharpton in his tax fraud case, and once moderated a panel titled “Closing Guantanamo: Terrorism and Civil Liberties in the Age of Obama” for Sharpton’s National Action Network. On the night of February 10, 2014 (at 11:21 pm), Bishop Orlando Findlayter, a politically connected Brooklyn pastor who had played a key role in galvanizing black voters to support de Blasio’s 2013 mayoral campaign, was driving in East Flatbush (Brooklyn) when he was pulled over by police for making a left turn without signaling. The officer at the scene then ran Findlayter’s license number and discovered two outstanding warrants, issued nearly four weeks earlier, for failure to appear in court for prior arrests (which were made at public protest demonstrations). Thus Findlayter was arrested on the spot and was charged not only for the traffic violation, but also for driving without a license. Because his arrest came at an hour when it was too late to be arraigned, he should, by law, have spent the night in jail. But Findlayter’s clergy friends, upon learning of the incident, quickly reached out to Mayor de Blasio, who in turn called top police officials and arranged for the bishop to be released immediately. Just hours later, on the morning of February 15, Findlayter sat with de Blasio at the head table at a Bedford-Stuyvesant breakfast, where Al Sharpton was a guest speaker. Ed Mullins, president of the Sergeants Benevelent Association, subsequently objected to how the Findlayter matter had been handled: “If a guy has a warrant, you don’t let him go. Period. There is no ‘discretion.’ What if you release him [and] he drives a block, blows a red light and runs somebody over and kills him?… He [de Blasio] just confirmed that it really is a ‘tale of two cities’”—a reference to de Blasio’s oft-repeated campaign slogan. Just two days later, however, a CBS news crew filmed a two-car caravan that included de Blasio’s SUV (in which the mayor was riding in the front passenger seat) speeding through the streets of Queens, blowing through two stop signs without even tapping the brakes, and changing highway lanes without signaling. At various points, de Blasio’s car was clocked going 40 to 45 mph in a 30 mph zone, and 60 mph in a 45 mph zone. CBS News’s Marcia Kramer reported that if a police officer had been following the mayor’s car, and had issued tickets for each of the various infractions that had been committed, the lead driver would have racked up 13 points on his license—more than the 11 points necessary for a license suspension. In January 2014, de Blasio selected the NYC Department for the Aging’s then-deputy commissioner, Bill Chong, a former member of the Communist Workers Party, to serve as commissioner of New York’s Department of Youth and Community Development. Chong had previously been board president of Asian Americans for Equality and had worked on Jesse Jackson‘s 1984 presidential campaign. On October 31, 2017, Sayfullo Habibullaevic Saipov, a 29-year-old Muslim immigrant and ISIS supporter from Uzbekistan, used a rental truck to mow down and kill eight people (and injure at least twelve others) in a busy New York City bike path as an act of jihad. Saipov was reported to have been a worshipper at Masjid Omar Mosque in Paterson, New Jersey, which was one of the mosques that the NYPD surveillance program had previously (prior to 2014) targeted because of its extremist teachings. Also in April 2014, the Daily Caller reported that de Blasio, who in 2013 had earned $165,000 as the city’s public advocate and another $52,000 in rental income, had paid only 8.3% of his total income in federal taxes for that year. At the time, he owned two row houses in New York City worth over $1.1 million apiece. In May 2014, New York City’s Human Resources Administration (HRA) announced that it was requesting—in compliance with Mayor de Blasio’s campaign pledge—a waiver from a federal law that required able-bodied, childless adults to work or to participate in a work-placement program for 20 hours per week in order to remain eligible for food-stamp assistance. In short, food stamps would now become an entitlement without any conditions. The HRA also stated that, starting that summer, it would forbid food-stamp recipients in New York from seeking the assistance of job-placement agencies, even vountarily. New York City Council member Daniel Dromm, the Democrat who authored de Blasio’s ID-card legislation, acknowledged that the cards could possibly be used to allow non-citizens to vote. “It is a possibility that it may be a way we can have people for the first time when they come in to vote, if they are non-residents, non-citizens,” said Dromm in February 2014. On December 20, 2014, a black gunman/Islamic jihadist named Ismaaiyl Brinsley shot and killed two uniformed NYPD officers, Wenjian Liu and Rafael Ramos, execution-style as they sat in their marked police car on a Brooklyn street corner. Brinsley’s motive was to avenge the recent deaths of Eric Garner and Michael Brown — the latter of whom was a black teenager who had been shot and killed by a white police officer four months earlier when Brown assaulted the officer and tried to steal his gun. Just three hours prior to carrying out his double murder in Brooklyn, Brinsley posted the following message on Facebook: “I’m Putting Wings on Pigs Today. They Take 1 Of Ours…Let’s Take 2 of Theirs.” He used the hashtag #ShootThePolice, along with two other hashtags that referenced Garner and Brown. Some 23,000 police officers from all over the United States attended Rafael Romos’s funeral on December 27, 2014. So large was the crowd, that many of the officers had to observe the proceedings via a large video screen that was set up outside the church. When de Blasio eulogized Officer Ramos, hundreds of those officers (outside the church) turned their backs to the screen in a sign of disrespect for the mayor. The officers followed through on their warning. For the week beginning December 22, overall arrests in New York City were down 66% compared with the same period in 2013. Citations for traffic violations fell by 94% (from 10,069 to 587); summonses for low-level offenses like public drinking and urination also declined 94% (from 4,831 to 300); parking violations dropped by 92% (from 14,699 to 1,241); and drug arrests by the NYPD’s Organized Crime Control Bureau fell by 84% (from 382 to 63). On December 31, 2014, Mayor de Blasio reappointed Brooklyn Criminal Court Judge Laura Johnson, whose two-year term was slated to expire later that night. Johnson had recently freed, without bail, two men who had threatened New York police just hours after Officers Rafael Ramos and Wenjian Liu were assassinated on December 20 (see above). One of the men, 18-year-old gang member Devon Coley, had just been busted for posting a photo on Facebook that showed a gunman shooting into an NYPD cruiser, with the caption “73Nextt” — a reference to the 73rd Precinct that covered Coley’s Brownsville neighborhood. Coley had a criminal history that included theft, knife possession, gun possession, and felony assault for his role in an armed robbery. But Judge Johnson ignored a prosecution request to set a $250,000 bail for Coley. On February 13, 2015, the de Blasio administration announced that beginning in the spring, changes would be instituted to the disciplinary code governing New York City’s public schools. The move was made to comply with the wishes of student advocacy groups claiming that too many children — disproportionately blacks and Hispanics — were being unnecessarily suspended for long periods after committing relatively minor offenses. The new de Blasio regulations required school principals to get approval from the Education Department’s central office before any student could be suspended. The new rules also required the NYPD to track and report any instances in which a student was placed in handcuffs, a practice that many allies of the mayor had long condemned. On February 17, 2015, Mayor de Blasio’s office released the New York City Panel on Climate Change’s 2015 report, which predicted that by the 2050s, annual temperatures would rise by 4.1 to 5.7 degrees, the sea level would rise by 11 to 21 inches, and annual precipitation would increase by up to 11 percent. To address these threats, the mayor pledged to cut the city’s greenhouse gas emissions by 80 percent. On March 4, 2015, de Blasio announced that New York City’s public schools would add two Muslim holidays to their vacation calendars, thereby fulfilling a promise he had made during his election campaign. “Hundreds of thousands of Muslim families will no longer have to choose between honoring the most sacred days on their calendar or attending school,” said the mayor. Invest in schools, not jails — and give a second chance to those coming home from prison. Among those who also attended and participated in the May 12 news conference were former Vermont Governor Howard Dean, Connecticut Rep. Rosa DeLauro, and activist Al Sharpton. Earlier in the day, de Blasio had met with Senator Elizabeth Warren and praised her “extraordinary” leadership on economic issues. Following the press conference, he had a White House meeting with President Obama. In June 2015 it was reported that under Mayor de Blasio, who had already disbanded a police unit that investigated Islamic communities and mosques in New York City, the NYPD was working to recruit more Muslims into its ranks. At the time, approximately 800 of its 35,000 uniformed officers were Muslims. In August 2015, the New York Post reported that de Blasio had created — for the longtime live-in lesbian girlfriend of one of his most trusted aides, Emma Wolfe — an unadvertised $150,000-per-year job as “campaign director” in the mayor’s Office of Immigrant Affairs. “That’s just a made-up position,” said one Democratic insider. “It makes no sense. They create a position for her for $150,000 that’s a redundancy.” The position was initially to be funded by a private grant, but because of “delays,” the salary was instead paid with taxpayer dollars. “Employers and landlords [in New York City] who intentionally and consistently ignore using pronouns such as ‘ze/hir’ to refer to transgender workers and tenants who request them — may be subject to fines as high as $250,000. The Commission on Human Rights’ legal guidelines mandate that anyone who providing jobs or housing must use individuals’ preferred gender pronouns. As the regulations, updated late last year, point out, some transgender individuals prefer to use pronouns other than he/him/his or she/her/hers. Examples of less prominent pronouns that some transgender people may choose, according to the city, are: ‘ze,’ which is the third person singular, such as he and she; and ‘hir,’ which is the third person plural, similar to they. “The legal enforcement is in line with the city’s guidance on discrimination based on gender identity or expression. ‘Gender expression may not be distinctively male or female and may not conform to traditional gender-based stereotypes assigned to specific gender identities,’ the city advises. In mid-May 2017, de Blasio made headlines when he refused to condemn Oscar Lopez Rivera, who had formerly been a leader of the Marxist-Leninist terror group known as the Armed Forces of National Liberation (FALN), and who was slated to be honored as a “National Freedom Hero” in New York City’s upcoming Puerto Rican Day Parade. During Lopez Rivera’s heyday, FALN members carried out more than 100 bombings in a terror war whose purpose was to force the United States to grant full independence to Puerto Rico. According to historian Ronald Radosh: “Lopez Rivera was arrested in Chicago in 1981, with FBI agents finding over six pounds of dynamite in his apartment ready to be used in planned future bombings. He was convicted of transporting firearms and explosives with the intent to commit violent crimes, to kill and injure people, and to destroy government property.” For these crimes, Lopez Rivera, who proclaimed himself “an enemy of the United States Government” at his trial, was sentenced to 55 years in prison – a punishment that was increased to 70 years after he subsequently (and unsuccessfully) attempted to escape. When outgoing President Bill Clinton in 2001 offered Lopez Rivera clemency on the condition that he thenceforth renounce violence, the terrorist rejected Clinton’s offer. Sixteen years later, an outgoing President Barack Obama granted an unconditional clemency to the still-unrepentant Lopez Rivera. When questioned about his plan to march right behind Lopez Rivera in the upcoming parade, de Blasio replied: “The organization he was affiliated with did things I don’t agree with … and they were illegal. I don’t agree with the way he did it. But he did serve his time.” That statement was untrue, however, given that Obama had released Lopez Rivera decades before the end of his prison term. While he was in Germany, de Blasio addressed a raucous protest that quickly turned violent and resulted in injuries to approximately 500 German police. At Familia’s funeral in New York City on July 11, 2017, hundreds of NYPD officers demonstrated their disgust for their mayor’s behavior by turning their backs to him while he delivered a eulogy. For an overview of de Blasio’s views on a variety of key political and social issues, click here. The Nicaragua Solidarity Network of Greater New York (NSNGNY) was formed by a number of New York groups and was active from 1983-2002. Its records are archived in the Tamiment Library at New York University. NSNGNY should not be confused with the Nicaragua Network, which was established in 1979 and remains active to this day.